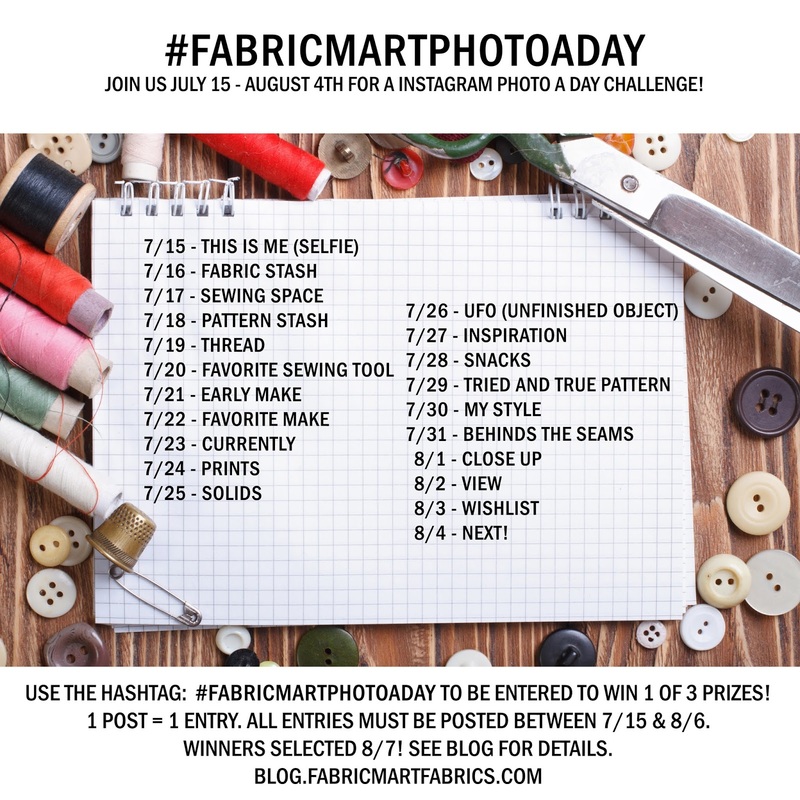 Introducing our Summer Photo-A-Day Instagram Challenge! We've created a twenty-one day photo challenge to add some excitement to your summer! Beginning July 15th, join Julie by taking & posting a photo with the day's theme on Instagram. At the end of the three weeks we are going to pick three random participants to win one of three prizes. Each day you participate is one entry into the giveaway. Which means if you post every day, you'll have twenty-one chances to win! For fairness we are only accepting one photo per day. So don't do three days at a time, or you're entries won't count! And you can participate just one day, or all twenty-one! Missed a day? No problem! Don't know what to post for another day's prompt? Skip it! The whole goal is to have fun & to get to know each other! On your very own Instagram page! Make sure that your page is public & that you use the hashtag #FABRICMARTPHOTOADAY, otherwise we won't be able to see your entry. If we can't see it, we won't be able to choose you as a winner! So it is very important that you follow these posting rules! Sorry this challenge is for Instagram only. Facebook entries will not be counted. The first day is this Sunday, July 15th! The last themed day is August 4th. We have allowed for two catch up days on August 5th & 6th in case you started a couple days late. ALL photos must be uploaded between 7/15 & 8/6! Photos posted prior to 7/15 will not be counted. Winners will be selected on 8/7, so make sure your photos are posted by 8/6! What are the prizes? Well we are glad you asked! 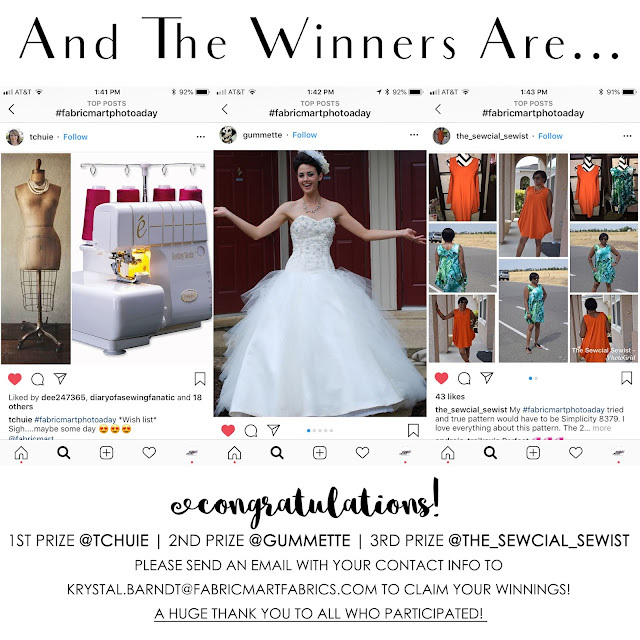 First Prize: A $100 Fabric Mart Gift Certificate. Second Prize: A Julie's Picks Membership. The photo challenge is open to any who wish to participate! However, the giveaway is only open to participants who are 18 years or older who live in the United States or Canada. This giveaway is sponsored solely by Fabric Mart, Inc. This giveaway is not sponsored, endorsed, administered, or associated with Instagram. Our Photo-A-Day Instagram Challenge has come to an end.